One of my PhD students, Fariza, has been extensively studying a single person, a women not so disimilar from herself. In doing so they have become friends and much of Fariza’s thesis (soon to be submitted) concerns the methodological issues surrounding this. One issue we have discussed at length is the importance of estrangement, that distancing oneself from the commonplace to make the taken for granted become apparent. We do not see the things closest to us: the dirty toenail, the crumpled sheet, the asymmetric fall of the piano music stand, the things lost because they are in the open. Artists and comedians often open our eyes to the unseen-because-unnoticed aspects of life, such as Emin’s own crumpled sheets or the poignant woman on the platform in “The Fall and Rise of Reggie Perrin”1. Garfinkel’s breaching experiments attempt to bring this incisive comic eye to social science. Of novelists Gabriel Garcí­a Márquez is the master of this; through his true to life yet surreal accounts, with sometimes tenderness and sometimes almost cruel dispassion, he describes in intricate detail the intimate yet insignificant. Berger talks about the way artists look at their work in a mirror to see it afresh and he himself sees the sunshine of lilacs in the mirror, lilacs that show him only their shadows2. I was reminded of one of C.S. Lewis’ Narnia books where the supra-reality of the mirror image is more crystal sharp, more ‘real’ than the ordinary world3. Mirrors bring to mind reflective practice, just as Fariza has to write herself into her own accounts, the mirror often shows not only the unseen side of an object but also oneself and oneself in relation to the object. The seer and seen are themselves seen and, like Berger’s lilacs, the partiality of one’s seeing becomes more obvious. The mirror is not so much important because it shows the hidden sun-glowed lilacs, but because it says that the shadowed petals are not the whole flower. I am reminded of that Dutch painting by van Eyck where the apparently pregnant woman and her husband stand in their home with their lap dog between them and discarded outdoor shoes untidily dropped4. 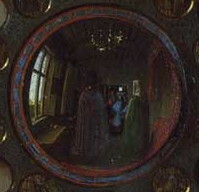 On the wall behind the couple is a convex mirror capturing the whole scene from behind, and in the reflected doorway where you stand is the tiny image of van Eyck and another. Unlike supposedly ‘good’ scientific writing in incomprehensible passive speech, the artist has not painted himself out of his picture. Berger also talks about paintings being painted for the moment of seeing, yet so many portraits do not look towards you, or even the artist, but through you, beyond you, to an unseen landscape. This may be because it is hard to paint eyes, or because it is hard to stare into the eyes of one’s painter. In life it is only with the deepest lovers or friends that we dare to share like this, hence perhaps the growing friendship that Fariza experienced when gazing deeply together into her subject’s life. Also, perhaps why the most intimate paintings have often been of the painter’s wives or lovers. Unusually in van Eyck’s painting, clearly of close friends, the couple do not gaze either aloof or uncaring past the viewer, but instead gaze within the painting demurely to one another … it is only the small dog that stares back. This may be part of the Mona Lisa’s allure. I have never seen it ‘in the flesh’, but everyone talks about the eyes that they follow you. However, look again, it is not so much that they follow you, but, unusual amongst paintings, they actually look at you and I suppose at Leonardo himself. I know Fariza has found this, and I am sure it is universal, that if we look closely and honestly at those around us, we begin more clearly to see ourselves . 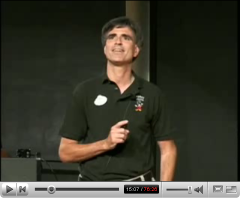 Last week a link to Randy Pausch‘s last lecture “Really Achieving Your Childhood Dreams” was posted on the CPHC mailing list. The lecture happened last September, so many of you will have seen this already, but I had not. If I browse web stuff at all it is always a quick skim, certainly for videos, but with theses to read, marking to do, emails to answer … still this I had to watch end to end. It is the most inspiring and challenging thing I have seen for years. While I have known aspects of Randy’s work, I don’t recall having met him in person, but he seems a truly remarkable man. While many achieve their dreams by trampling on the dreams of others, here is someone succeeding whilst building up those around him. Recently I was in a meeting where the issue of ‘core’ computer science came up. One person listed a few areas, but then this was challenged by another member of the group who said (to be fair, partly in jest), that core computer science should certainly include computer architecture, but not the ‘human stuff’. I felt a little like a teenager complete with T-shirt and iPod dropped into Jurassic Park arguments that I thought had been put to bed in the 1980s suddenly resurfacing – how do you explain this white thing that makes sounds from its earphones to a caveman wearing skins? However, I also felt a certain sympathy as I often wonder about computer science as a whole; indeed it has its own arguments in the 1960s and ’70s as to whether it was a ‘discipline’ as opposed to just an application domain for maths or electronics, or just a tool for business. Maybe one of the clinchers was the theoretical foundations of computing in the work of Church and Turing … but strangely enough at Lancaster the closest to this, the course on algorithmic complexity, is taught by a HCI person! One of my worries in computing is that these theoretical foundations are still weak, there is black hole in the theoretical centre of computer science1. However, these theoretical issues were certainly not what was bothering my colleague. To answer his challenge and my own worries about the discipline we really need to know – what is computing? Recently heard some group feedback on our HCI textbook. Nearly all said that they did NOT want any CSCW. I was appalled as considering any sort of user interaction without its surrounding social and organisational settings seems as fundamentally misbegotten as considering a system without its users. Has the usability world gone mad or is it just that our conception of HCI has become too narrow? The key is that it is I am now using the CSS clip property which allows you to show selected parts of an image (or in fact any HTML element). This was made a little more complicated due to the fact that the W3C pages for clip give running examples for every other kind of visual effect … but not clip! Googling was a nightmare as it turns up page after page in forums saying “I can’t get clip to work”! Happily I found seifi.org (a blog that looks like a really great web resource) and a post on Creating Thumbnails Using the CSS Clip Property. This was full of meticulously laid out examples … Mojo Seifi, you are a star!